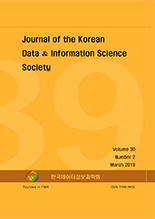 이정현, 오상진, 윤여창, 안영호, 김재성, 조완섭, 이성덕,(2019).V2G 의사결정을 지원하는 전력사용량 데이터의 시계열 예측.한국데이터정보과학회지,30(2),401-414. 최근 전력 수요가 급증하는 상황에서 많은 에너지 관련 연구들이 대체에너지 개발, 전력사용의 절감과 효율, 전력 사용의 시간차 분산 그리고 에너지 저장기술 등을 다루고 있다. 본 연구에서는 한 생산시설에서 수집된 전력사용량 시계열 데이터를 분석하면서 Peak 전력사용량과 그 시간대를 예측에 대한 중요성을 인지하였다. 이는 상시전력과 대체전력간의 전환, 에너지 거래 등에 있어서 필수적인 예측분석이기 때문에 더욱 실효성을 높일 수 있는 결과 도출을 위해 24시간의 단기 예측을 분석 목표로 설정하였다. 본 논문에서 수행한 시계열 분석방법으로 SARIMA모형과 계정성지수평화법이 사용되었고 이러한 분석모델이 향후 V2G 또는 ESS 관련된 현업에서 활용과 확장이 될 수 있도록 기대한다. The domestic energy demand is currently in crisis, and this is related with the phase-out nuclear power plant and expansions of EV charging stations. Moreover, the additional demand will be increased because of the political issues of the Korean peninsula, too. Many studies have focus on and dealt with alternative energy development, energy efficiency and energy storage system. In this study, we analyzed time series data of the energy consumption. As the result, we recognized the importance of predicting the amount of energy peak load and its time zone when it is conversed from main power to ESS, and energy trading. Therefore our goal is to get more reliable results through a short time period analysis based on 24 hours. In order to conduct this research study, Seasonal ARIMA (SARIMA) model and seasonal exponential smoothing method were used. We hope this analyzed result will be utilized positively on real environment of V2G or ESS in the future.